Daniel Bryan takes us on an educational journey at a concession stand. Are you healthy? Are you happy? Do you know why you eat garbage? Because you’re empty and you’re filling a void. That’s also why you cheer for AJ Styles. Bryan throws a hotdog at a guy’s head and a drink at a guy’s chest. He then goes to the merch table and asks for one “Yes Movement” t-shirt. Oh wait, there are none of those shirts because Bryan killed the “Yes Movement.” But there is plenty of AJ Styles merch, all of which is killing the planet. Daniel Bryan makes his way through the crowd towards the ring. Bryan says he is changing the world one person at a time. Styles fills a void for about 30 seconds, but Bryan will fill that void with something meaningful. As Bryan reaches ringside, he is attacked by R-Truth. Pretty good match, but it was very short. I liked that R-Truth was still mad about the attack from Bryan on the Christmas episode. The fight here was quick and emotional, and the emotion that drove Truth also seemed to be his (rather quick) downfall. AJ Styles attacks Daniel Bryan on the stage. Backstage personnel swarm out to keep the men apart, and Bryan escapes to the backstage area. Very good match! Mysterio spent a lot of time in the ring for his team early in the match, then Ali had some good offense before getting thrown onto the announce table by Joe. That led to a fast and extremely fun finish. Ali and Joe looked very good, but the highlight here was seeing Mysterio and Almas go one on one. Rey hit Almas with a huge piledriver that was sort of a Canadian destroyer starting from a different position. That was great, and the exchange they had at the finish was great. I’d like to see more of them against each other. Carmella says she was SD Women’s Champ for 130 days, and she became champ by winning Money in the Bank. All Carmella has ever needed was an opportunity, and that’s what she has tonight. The Usos are ready to defeat The Bar. The Miz complains to Shane that The Usos are getting an opportunity to qualify for a tag title match. Shane says he and Miz are far from earning a title shot, but Miz says Shane is in charge, so he can just make the match. Shane says they need to do it the right way. Miz reluctantly agrees. In the ring, Rusev says that Lana got hurt last week due to the selfish actions of Shinsuke Nakamura. As a husband, Rusev says that Nakamura has crossed a line. He calls Nakamura to the ring so he can crush him. Nakamura is sitting in the production truck. Nakamura says Lana’s injurt is not his fault. It’s Rusev’s fault. To prove it, Nakamura plays last week’s attack. Afterwards, Nakamura says that Rusev crushed Lana. Back in the ring, Rusev runs off to find Nakamura. When Rusev gets backstage, Nakamura rams him with a rolling crate. Officials break up the attack, but Nakamura gets in a Kinshasa before leaving. Becky Lynch thinks it’s amusing that she has to jump through hoops to get back the title that she never lost. A video tribute to Mean Gene Okerlund. Very good match. This was actually probably a great match, but a distraction by Mandy Rose towards the end made me roll my eyes super hard. Everything before that was super good though. The Usos were fighting hard, and The bar was getting increasingly frustrated. This would have been a good title match, but really, I’d like to see a different team get a shot at the titles. This is a fresh start after all. After the match, The Miz heads down to the ring. Miz congratulates The Bar on their win and for dominating all the tag teams on SmackDown Live. They haven’t beaten Miz and Shane McMahon though. Miz offers The Bar an opportunity to face himself and Shane at the Royal Rumble. Cesaro consults with Sheamus. Sheamus kicks Miz in the face. Cesaro accepts the challenge. Mandy Rose looks smug as she walks with Sonya Deville. 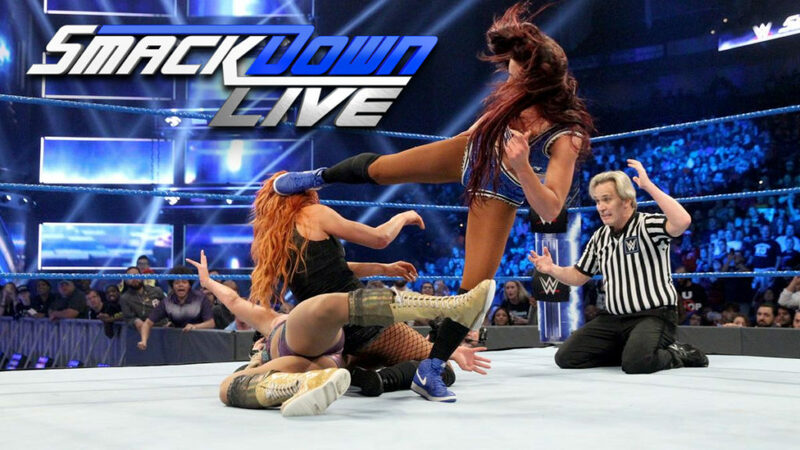 Naomi looks pissed as she attacks them both. Deville and Rose begin to get the upper hand, but Jimmy Uso arrives to break up the fight. Charlotte Flair says Carmella and Becky Lynch have been hot at times, but Charlotte has been on top of the RAW and SmackDown women’s divisions for years. Kayla Braxton wants a word from Daniel Bryan. Bryan says he doesn’t care why AJ Styles attacked him earlier. Styles isn’t vicious. The new Daniel Bryan is more vicious than anyone has seen yet. Styles will find out how vicious Bryan can be. NXT superstars are still coming to the main roster. Shane McMahon checks on The Miz. Miz is fine, and he says Shane’s plan worked. Shane says he didn’t tell Miz to pick a fight with The Bar. Miz says if they’re not going after The Bar, then why are they even teaming up? Shane is frustrated, but he’ll be with The Miz at the Royal Rumble. Very good match. It seemed clear that Carmella was in this match to protect Charlotte or Becky from a direct loss, but Carmella looked good regardless. I think this match helped Carmella while making Charlotte and Becky look good at the same time. The action was very good, and there were a lot of nice multi-person moments. After the match, Asuka heads to the ring. She holds up her title towards Becky Lynch as the show ends. I enjoyed this show very much. I rolled my eyes at the Mandy Rose stuff again, but again, that was pretty much the only thing I didn’t enjoy. I thought all the matches were exceptionally good for a weekly TV show. I’m not really a fan of Shane and Miz getting a title shot at the Rumble, but I suppose that will maybe lead to something between the two of them at Wrestlemania. I just hope they don’t win the tag titles. That wouldn’t be a fresh start, that would be a large step backwards. As much as I loved certain moments in the Mysterio/Ali/Almas/Joe match and the triple threat main event, I think I enjoyed The Usos versus The Bar the most consistently throughout (in spite of the finish).